Shopping for Energy Star 50-100-150 light bulbs is getting easier every year. As consumers raise demand for these energy-saving bulbs and businesses find the production of older incandescent bulbs to be too costly, Energy Star bulbs are becoming more commonplace. Despite this, some places are better for buying these bulbs than others. Energy Star is not the name of a brand of bulbs, but rather the name of a program developed by the EPA in 2005. Under the provisions of section 103(g) of the Clean Air Act of 1992, the EPA was tasked with developing "a basic engineering research and technology program to develop, evaluate, and demonstrate non-regulatory strategies and technologies for reducing air pollution." In section 131 of the Energy Policy and Conservation Act, the Energy Star program is defined as a "voluntary program to identify and promote energy-efficient products and buildings in order to reduce energy consumption, improve energy security, and reduce pollution through voluntary labeling of or other forms of communication about products and buildings that meet the highest energy efficiency standards." As with any other piece of technology, there are advantages and disadvantages that come hand in hand with using these bulbs. The energy savings offered by Energy Star bulbs are a major component of their popularity. Over the course of a year, the US Department of Energy states that the average incandescent bulb costs around $4.80/year to operate. By contrast, an Energy Star CFL bulb costs roughly $1.20/year to operate. 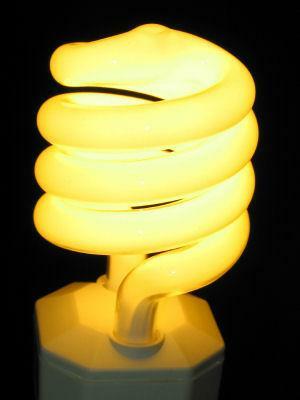 The Department of Energy also states that most CFL bulbs pay for themselves within nine months. There are many different kinds of Energy Star bulbs for people to choose from, all of which are cheaper to use than incandescent bulbs that produce the same amount of lumens. Energy Star bulbs are more expensive than standard incandescent bulbs. Despite the long-term savings, this may push some away from buying them due to the initial investment. Some Energy Star bulbs contain toxic chemicals and require special disposal. This is mostly applied to CFL bulbs, which contain mercury. If a CFL bulb of any kind breaks in your home, you should allow the room to air out before cleaning up. GE Lighting 78952 Energy Smart 3-Way Spiral Light Bulb: This spiral 3-way bulb has a medium base and should last around five years with approximately three hours of use per day. It is priced less than $10 at Amazon.com. Feit 3-Way Compact Fluorescent: This bulb claims to use nearly 80 percent less energy than incandescent bulbs and last around nine years. The bulb costs less than $15 at Bulb America. GE 79455 3-Way Soft White Energy Smart 2-Pack: Get two bulbs for around $25 in one package from Sear's Marketplace. Each bulb should last around 8,000 hours of use. Litetronics Low Profile/Better Fit 50/100/150 Watt Incandescent Equivalent: Get a great deal on this bulb when you purchase in bulk from Bulbs.com. Prices start at just under $15 for one bulb, but will drop when you order 20 and then 40 or more bulbs. Each bulb should last around 10,000 hours. Whenever buying light bulbs online, be sure to check shipping charges before ordering. Ace Hardware stores also carry the GE 78952 3-Way Spiral light bulb. There, it retails for around $14. Use the website to check for local availability and pick it up free of charge at your store. Home Depot sells the Philips Soft White 3 Way CFL Light Bulb for near $14, which has an approximate life of nine years. You can order online and ship home or to the store closest to you or look for it at your local store. Staples offers Energy Star rated light bulbs both online and in-store, like the GE T4 Spiral CFL Bulb in soft white that costs around $13. It has a life of around 10,000 hours of use. Even if the online ordering is out of stock, you can always search your local store and pick it up there, often within two hours. Select "Reserve & Pickup" to find the nearest store. CVS has the GE Soft White 3 Way General Purpose light bulb for around $16. This bulb should last around seven years with useage at four hours per day. It qualifies for free shipping in some circumstances. If you want to pick it up at a store near you, use their locator to find the nearest location. Keep in mind that local prices may vary slightly from those online. The EPA has developed a useful tool for finding Energy Star bulbs that can be accessed by anyone with an Internet connection. This retailer location tool allows anyone to plug in their zip code and search for specific types of Energy Star appliances or accessories. You can find Energy Star bulb retailers in your area very quickly and efficiently using this tool. You can also make use of one of many smartphone applications to find Energy Star bulb retailers in your area. Using the Light Bulb Finder application on Android or iPhone devices, you can search for local retailers that sell these efficient bulbs. One thing it's important to note when you go shopping for Energy Star 50-100-150 light bulbs is that those are not the numbers you are going to see on the label. Compact fluorescent light bulbs are a much lower wattage for the same output of light compared to the light bulbs you are used to buying. Remember also that there are many types of Energy Star light bulbs, and if you are replacing a bulb in a three-way light fixture, you must choose a light bulb that is approved for that use. The same is true if you have a fixture with a dimmer installed. The standard energy efficient light bulbs will not work in these fixtures, so do your homework and seek out light bulbs that will do what you need them to do. Buying Energy Star light bulbs doesn't just cause you to use less electricity. It also helps you save money in the long-term. In fact, there is a wide range of Energy Star appliances you can choose from when buying for your home or office. The cumulative effect these can have on your energy bill is exceptional.